A very special collaboration that has joined Giuseppe Zanotti and the American rapper Kanye West, but also the strangest collaborations we're seeing a lot lately, this year as never before the footwear sector is open to a kind of experimentation that exceeds the new screens and conventions and typical results obtained, as in this case. Giuseppe Zanotti not then you do not pray when it comes to creating models of special shoes who can strike at first sight, and I would say that even in this case has done a great job! The collections of Giuseppe Zanotti are increasingly popular in the world and often chosen for the red carpet by celebrity, I just remember that the last of a shoe collection for spring-summer 2012 the Italian designer has been chosen to complete the outfits of the angels of Victoria's Secret during the last show! Kanye West debuted in the fashion world very recently and wanted his models to wear walking shoes, Giuseppe Zanotti at the last Paris Fashion Week, four models were the result of this collaboration, a capsule collection very characteristic. 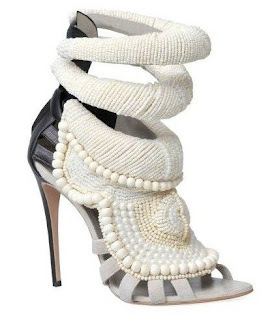 The sandals that we see today have covered stiletto heel in black suede upper 11.5 cm, while the rest of the upper, beginning with open lists on the tip toe to reach the finish on the instep and ankle straps, features the pearls, pearls cream in different sizes and colors that create a unique, almost ethno chic, do not you agree? Obviously we are talking about a limited edition, the price of luisaviaroma.com comes to 4500 euro, but price aside, they are beautiful, too?